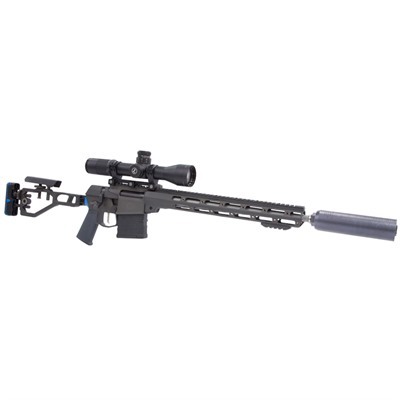 Far more than a chassis rifle, the Q Fix in 6.5 Creedmoor is a bolt action rifle with the ergonomics of an AR-15 that delivers target rifle accuracy right out of the box. The Q Fix’s "unibody" one-piece aluminum receiver contributes to its superb accuracy by keeping the trigger, bolt, and fire control components in precise alignment and preventing accuracy-compromising movement between them. The Q Fix’s short, 45° bolt throw is one of the shortest and fastest in the industry - as close as you can get to a straight-pull bolt. Under the hood of the Q Fix 6.5 Creedmoor sits an incredibly crisp, two-stage trigger that breaks cleanly at 2 lbs. The internal safety mechanism is engineered to ensure the Fix is drop safe, too. • AR-15 ergonomics leverage your existing "muscle memory"
What about the name? The Q Fix 6.5 Creedmoor provides a unique combination of accuracy and portability that fixes most of the common problems of traditional bolt action precision rifles.